“Malthus,” philosopher of biology Robert J Richards has observed, “brought Darwin to recognize the tremendous fecundity of organisms and their consequent struggle to acquire the necessities of survival” (Richards 1987, 100) but Darwin also, “misread Lamarck from the beginning, for clearly neither the Histoire naturelle nor the Philosophical zoologique invoked will to explain the inheritance of acquired characteristics”(Richards 1987, 93). 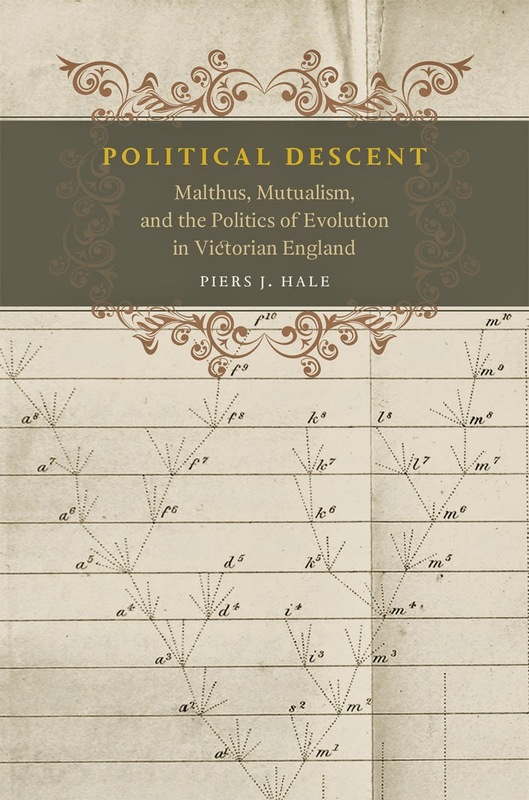 Piers J. Hale’s Political Descent: Malthus, Mutualism, and the Politics of Evolution in Victorian England is not only about this moment of Charles Darwin’s close reading of both Malthus and Lamarck, Hale’s fascinating and provocative study is also about the ways the legacy of that reading came to haunt intellectual modernity and after. For the Victorians, Hale writes, “biology and politics were mutually informative subjects”. That is surely true now as well. Thus in a book ostensibly restricted to Malthus, mutualism, and politics, we find so much more. Political Descent must be situated historiographically in a longstanding debate among historians of biology about the politics of evolution. Adrian Desmond, Robert J. Richards, Janet Browne, Peter Bowler, and many others have had much to say on these matters, and most historians readily accept Adrian Desmond’s assertion that evolutionary ideas – particularly Lamarckian ones – were associated with radical politics. Hale’s contribution to this debate is to show firstly, as most historians recognize, that Darwin’s discovery of a Malthusian mechanism for natural selection, moved the politics of evolution into a more normative political dialogue, while secondly showing, which most historians have missed, that a strong tradition of anti-Malthusian, heavily Lamarckian thought persisted into the twentieth century. The politics of evolution, Hale demonstrates in Political Descent, was thus much more contested than historians have hitherto recognized. In broad brush detail, Political Descent tells a story that is about the formulation of theories of natural law and the advance of secularization. It is a book about labor and industry, individual struggle and social evolution, political norms and radical politics, and the relationship between culture and biology. Famous ‘Darwinians’ and ‘evolutionists’ grace its pages – Spencer, Chambers, Wallace, Huxley, Kropotkin, Galton, Weismann, and Pearson. There, too, however, are seemingly less likely figures for a history of biology – Adam Smith, Karl Marx, Beatrice Webb, William Morris, Herbert George Wells, George Bernard Shaw, Benjamin Kidd, and many others. All saw the question of whether natural selection acts on individuals or groups to be essential to answer, and appropriately for our Neuro Times, most also recognized that the answer would have immediate ramification for the study of mind, brain, and human behavior. Political Descent begins with Charles Darwin but places him in an ongoing debate about the politics of evolution. Darwin had long reflected on both man’s moral and rational character when he began writing his famous essay On the Origin of Species. Many of his teachers and mentors had possessed differing opinions on this controversial subject. On his famous voyage, Darwin had also witnessed the way the environment could influence the behavior of human beings. It was clear to Darwin that men had acquired the capacity for sympathy, and, in time, he had come to believe that this was an evolved faculty but one potentially preempted by harsh climates and primitive living conditions. His thoughts early-on about these matters had drawn heavily upon the writings of Erasmus Darwin, his paternal grandfather, and William Godwin, the most famous political radical of the late 1700s, an English Condorcet, and quintessential Enlightenment optimist, who argued that the perfectibility of the individual led to the perfectibility of society, and, echoing Condorcet, had proposed that any pressures that might accompany improved life could be mitigated by human reason which increase our power over nature. It was Godwin’s optimism that fell afoul of Malthus’ keen pen. As Darwin read his brother’s sixth edition of Malthus’s essay on Population in 1838, he found there both his mechanism for natural selection and also his source of departure from the tradition of his grandfather and Godwin. Hale contends that in Malthus’s essay, Darwin discovered a means for moving talk of the evolution of species from radical politics into the normative, if Whig, mainstream. 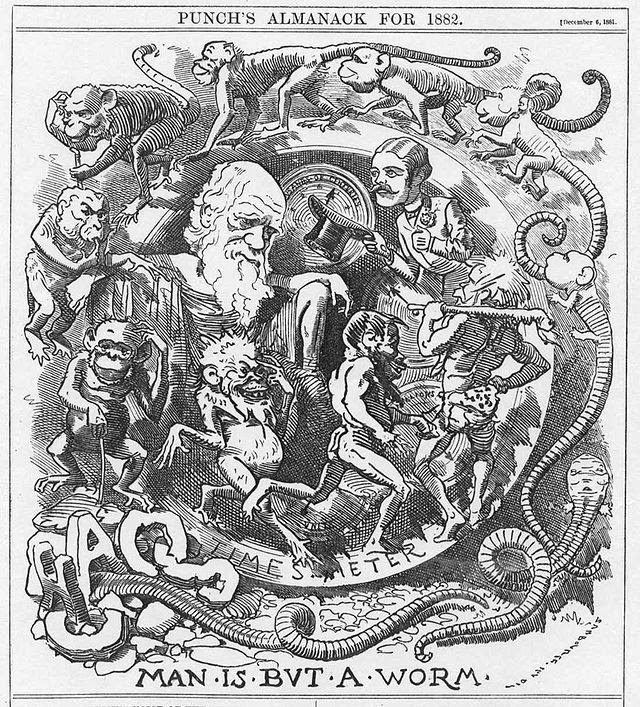 Punch's 1882 parody on the politics of evolution. Darwin’s ideas, of course, came into being in a rich context of evolutionary ideas and political questions about the social character of human beings. Darwin’s contemporary, Herbert Spencer, had suggested that human beings had developed from some lower race. Unlike Darwin, Spencer had adopted Lamarckian mechanisms of heredity early-on in his own philosophical and scientific musings. He considered the environment a sufficient determinant of population, and believed that civilizing processes which conquered environmental challenges would lead to the eradication of the baser ancestral instincts as well. Unlike many of his liberal contemporaries who saw a role for the state in managing progress, Spencer expressed confidence that nature was sufficient for bringing these circumstances about: nature would furnish increasing human cooperation and social harmony. Spencer’s sanguine functionalism thus saw in individualism a natural force rising a mutualist tide through adaptation to circumstance. Where socialists saw evolution leading naturally to collectivism, Spencer saw evolution leading to individuation within a cooperative society. Where most liberals saw an increasing role for the state, Spencer believed that the problems the state would seek to regulate would naturally diminish without assistance. Evolution, always political, was now central in debates about how best to organize society. For liberals in the mold of Huxley, Hale writes, “science, technology and education, as well as compassion, all worked to raise us above the brute struggle for existence” (p. 171). Darwin was sympathetic. 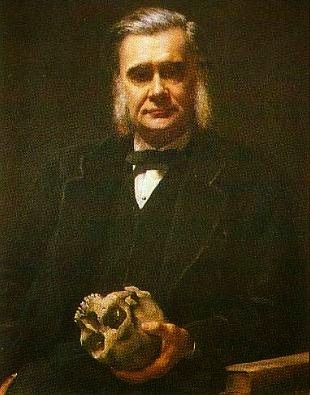 For his part, Darwin’s own liberal views had led him eventually to conclude that in-so-far as human evolution was concerned, sexual selection was more important than natural selection or the environment. Darwin thought that natural selection might easily account for competition between individuals, but he argued that sexual selection – especially for other-regarding attributes, intelligence, and ethical behavior – could easily explain the appearance of group solidarity, cooperation, and other differences among groups. On this point Hale is especially good – no one historian I think has focused so much attention on sexual selection. Darwin’s effort in his Descent of Man was partially aimed at refuting the idea that natural selection endorsed every cheating tradesman – natural and sexual selection could quite happily account for the evolution of ‘other-regarding’ altruistic morals. Socialists and anarchists – really a cornucopia of groups in the 1880s and afterwards – pushed against these liberal differences of interpretation by granting an even greater Lamarckian twist than Spencer would have countenanced. Darwin’s economic metaphor was evident enough, but socialists saw the degrading influences of capitalism as fundamentally habit-forming. For them, mutualism assured human flourishing. Lamarck’s biology offered the possibility of new forms of consciousness – healthy forms. Spencer, unlikely as it might seem, would probably have agreed, although would not have thought the state capable of fostering mutualism. While the majority of socialists and anarchists followed early radical critics in regarding Malthus as an apologist for the status quo, Fabian socialists, who sought to impose reforms incrementally and often by elite fiat, self-consciously accepted Malthus’s natural laws and therefore advocated for policies that could constrain population growth. Others, who were skeptical of Fabianism on this point, William Morris among them, resisted efforts to impose socialism and sought to dispel efforts to naturalize Malthusian law. Anarchists such as Peter Kropotkin similarly sought to reorient debate about the biology of society away from Malthus towards a deeper biological consideration of the struggles produced in accommodating to new environments. In difficult environments, Kropotkin argued, competition between individuals might not even exist because those conditions would push creatures into mutual aid with one another. If this were true, then industrial capitalism could be seen as a social pathology, degenerating the instinct for individuals to help one another, and Malthus, in turn, represented an ideology of species decay. These tensions between Malthusian and Lamarckian worldviews came to a fore around the question of civilizational degeneration. Many socialists believed that work empowered human beings, and that as humans returned to nature they would become freer from the injustices of industrialization. All such views, however, were predicated on a faith that the environment mattered in human flourishing and that good habits would be passed between generations. This confidence collided with Friedrich Leopold August Weismann’s studies which cast grave doubts on the Lamarckian hypothesis. Many concluded from Weismann’s studies that human beings were tied to a deep history – that they were in fact far closer to their primitive ancestors than had been widely-accepted. Worse still was the possibility that the socialists might achieve their aims. Weismann and others argued that without pressures on human beings, humans would degenerate to the point where they could no longer be kept to a standard. Mate selection mattered too: already there were signs of the advance of degeneration in individuals, not least because social reforms had mitigated the Malthusian struggle. Karl Pearson would eventually take this further by pointing out that changing the environment for inherently weak stock was Panglossian, for the degenerates would not be able to change their inherent genetic weakness and feeblemindness. Such a harsh view, when acquired by cultures and imperiums would become the stuff of the twentieth-century, an Age of Extremes. And much violence and death would follow. Political Descent is a very good book. It is original and necessary. It tells a fascinating story that is not at all well-known and thus it is well-placed in an area of scholarship that at times feels like it has little left to say. There are, however, curious oversights in the volume too – oversights which for me have little to do with Hale’s approach and more to do with broader trends in the history of biology. It is hard for me to see the names of John Ruskin or Herbert Spencer appear in a text and not be drawn also to the more malignant meanings of nineteenth-century European capitalism, namely the empires and imperial politics of peoples who saw themselves as the natural rulers of the globe. We pass over too quietly the significance of being able to pronounce and pontificate upon the primitives, and while it is true that such condescensions, conceits, and attitudes were typical of many Victorians, the preponderance of such values in nineteenth-century biology does imply an even wider meaning for the politics of evolution. Certainly, by the twentieth-century many of the best-informed anthropologists were already turning away rather quickly from evolutionism and other such apologetics for empire, preferring instead historical relativism and cultural pluralism in their studies of people. That was not an accident. This is not to say that Political Descent should be held responsible for the limitations of the wider historiography. But there surely is room for a second book called Imperial Descent too – and that is a book that will show Darwin and Spencer, at the least, in a somewhat different light. This quibble notwithstanding, Political Descent is a revisionist and invaluable work of scholarship. It is also a pleasure to read. A thoughtful and well-researched book, in which Hale complicates historical and contemporary assumptions that Darwinian evolution and Malthusian competition necessarily went hand-in-hand. He carefully illustrates how in Victorian England, evolutionary theory was equally compatible with socialist interpretations of natural order. Worth reading! Now we can possibly bring around more of such like evident values and prospects which are indeed considered to be essential. Great review. Could you please suggest me other related books? this is a great research.